You want to hold a coil of wires in place? Zip-ties are perfect for the job. As a boater, there are a few items you always keep on hand. A length of rope. Extra drain plugs. A spare life jacket. I could walk out to any of my boats right now (or for that matter, to my truck), and lay my hands on any one of these items. Here’s one more thing, which should certainly be on the list: zip-ties. You want to hold a coil of wires in place? 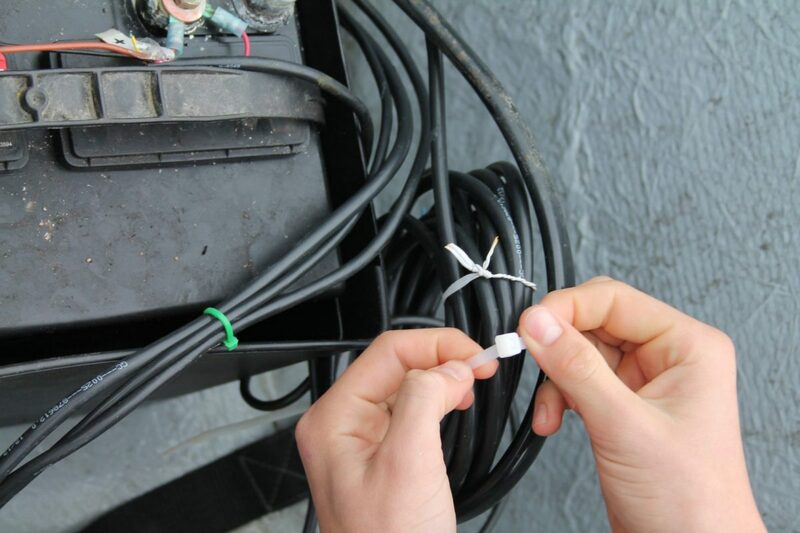 Zip-ties are perfect for the job, and they won’t rust like those metal tie-wraps (background). Why am I so hot on these simply little plastic strips? For one, they’re incredibly useful. Glancing out the window at one of my boats right now, I can see where I’ve used them to secure loose wires, attach cables to the T-top pipework, and, in the latest instant-fix, secure my trailer’s license plate after a bolt jiggled free and left the plate hanging. No, these things aren’t a permanent fix. When subjected to direct sunlight they’re only good for a year or two, before they turn brittle and snap into bits. But for a quick-fix they rank right up there with duct tape. Here’s the question: do you have a pack of zip-ties, in assorted sizes, stowed somewhere in your boat, right now? Is there a pack in the glove box of your truck, too? If not, why not? Here’s my bet: after reading this you’ll let it go in one ear, and out the other. And at some point during the next three months, you’ll encounter a situation in which you think to yourself “boy, a pack of those zip-ties sure would come in handy right about now.” Or, on the other hand, maybe you’ll put a selection of these amazing little doo-dads in your boat right now, and at some point during the next three months, be glad you have ’em.